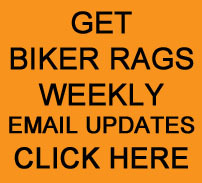 On Monday, July 4th, 2011- we had another Biker Rags Fun Run. We left Biker Rags at 11:00 am for a 140 mile ride that took us through Lenoir City, Kingston, Rockwood and then to Spring City. It started to rain just before Rockwood so we stopped and put on rain gear. By the time we reached Spring City, the rain had stopped. From Spring City, we rode over Watts Bar Dam and then took River Road back up to Kingston. From there we took 72 to Loudon where we stopped for gas. Before we could gather back up, the storm rolled in, forcing everyone to head for home. We started with 32 or 33 bikes, picked up a couple of more along the way, and made it 100 miles before the storm came through. Again- thanks everyone for riding with us on our Fun Run. The next one is scheduled for Sunday, July 24, 2011 at 1pm. Hope to see you there. Here are photos from the ride. Included are some great shots sent to us by Grey Hutson. Thanks Greg! Photo courtesy of Greg Hutson. Our guest photographer, Greg Hutson, with his daughter Laura.